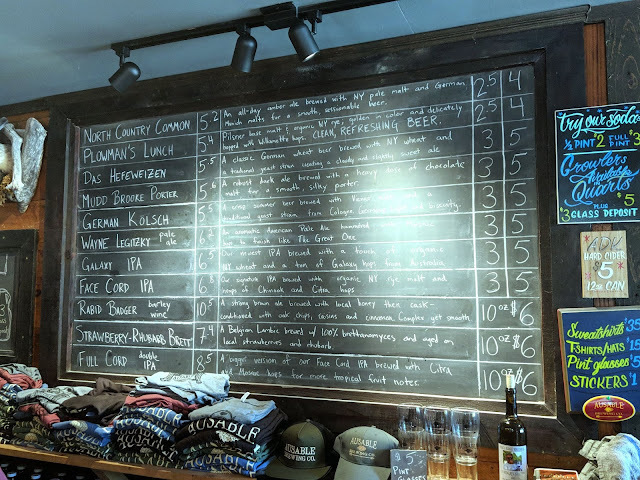 One of my favorite and I mean favorite ways to end a great day of hiking Indian Head Overlook is by sipping tasty local beer at a craft brewery (extra point if its a new one). 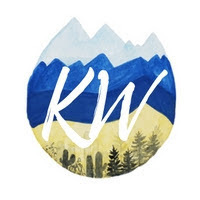 Trying new breweries is always fun, but beer just tastes so much better after a long hike, mowing the lawn, or in the back country areas of ski trails - can I get an amen? 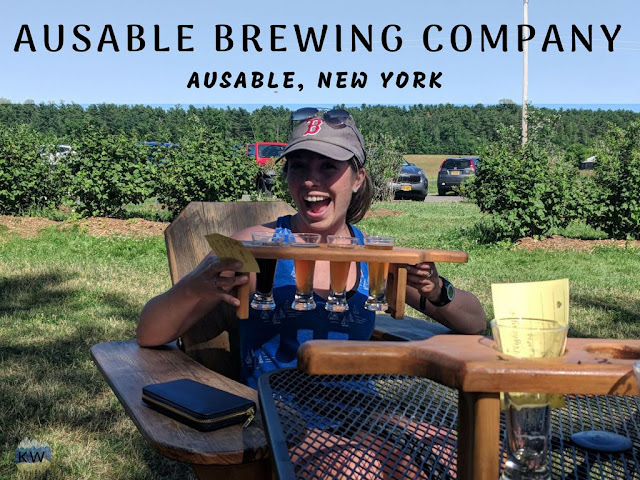 When Ryan mentioned passing by a brewery on his way to the campground, we quickly added Ausable Brewing Company to our list of must-see before we leave. Maybe it was the hike, maybe it was this gorgeous piece of property, but views of Indian Head followed by local cold beer in an oversized Adirondack is just about the best way to celebrate a Saturday. "Ausable Brewing Company is a farm-based nanobrewery owned and operated by brothers Dan and Dylan Badger. 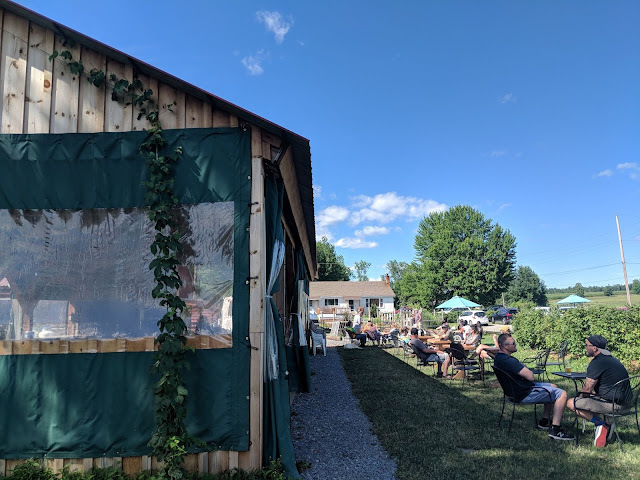 Located on 140 acres in the Champlain Valley just east of the Adirondack High Peaks, ABC is dedicated to serving a variety of high quality ales, lagers and house sodas in a relaxed and fun atmosphere. Our focus has always been on consistency, quality and creativity. We don't wholesale our beer to bars and restaurants. 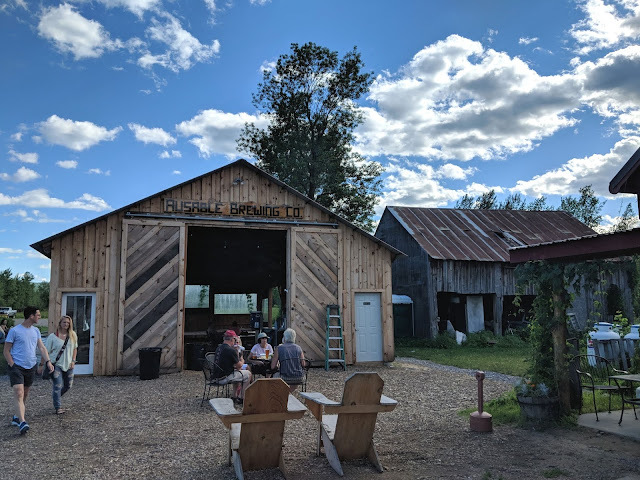 In order to come taste what we craft, you must be willing to take the scenic drive through some of the best farmland in the Adirondack Park". Read more about the brewery HERE. The brewmasters brew their delicious beer in an 1880s barn that we renovated in 2013. The brewery also boasts its own farm and they grow 3 varieties of hops as well as various fruit trees and bushes that sometimes find their way into the beer. You can enjoy their delicious concoctions out on the lawn or in the pavilion. The ever-changing tap list that always includes 11 beers and 2 house sodas. We did two flights of four to sample of the the breweries current tap rotation. 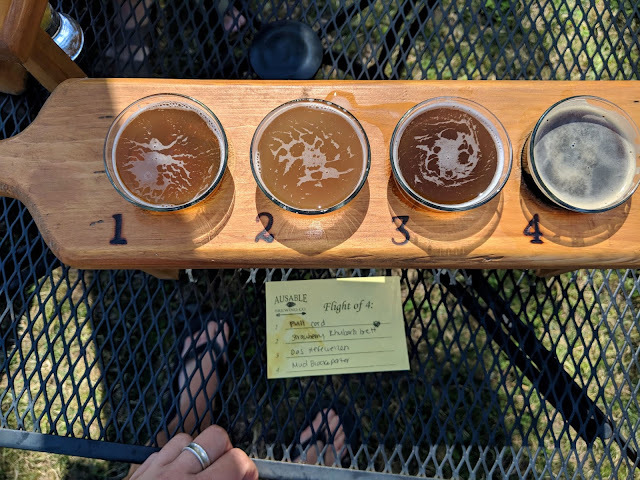 I tried a flight featuring Full Cord (double IPA), the Strawberry Rhubarb Brett (Belgian Lambic), Das Hefeweizen (german wheat beer), and Mud Brooke Porter. I loved the Hefeweizen and Brett, and enjoyed the Double IPA and the Porter. I was impressed by the expansive beer list featuring everything from Double IPAs to Belgian and German beers. There is seating all over the property, from inside the pavilion area to various tables and chairs scattered throughout the property. A food truck was parked outside so you could enjoy a snack with your tasty flight. The staff was filling growlers, arranging flights, and pouring pints for happy beer drinkers in northern New York. The staff was knowledgable and fast and I was impressed by the crowd, the atmosphere, and the amount of brewery swag. 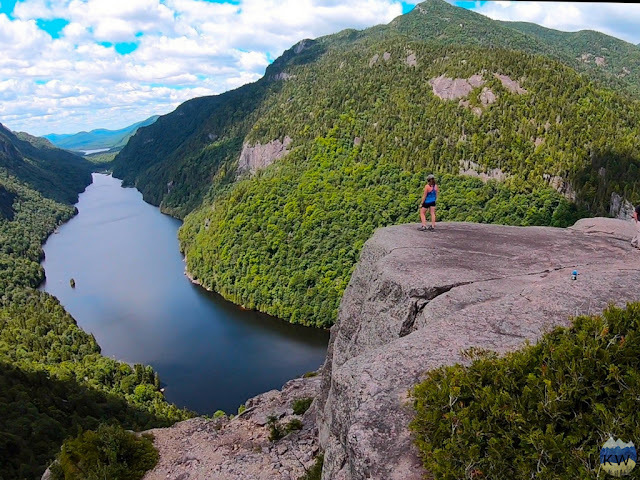 If you find yourself in Northern New York, or if you just finished hiking beautiful Indian Head overlook, then I can tell you the perfect way to wrap up a perfect day in the Adirondacks. 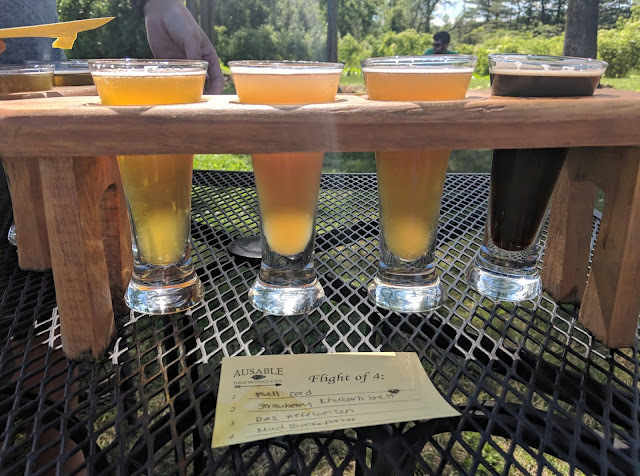 Stop at Ausable Brewing Company and try a flight of some of their craft beer, brewed in an old barn on a beautiful little farm. Listen to live music and enjoy some local food truck food while enjoying a pint of your favorite beer from the tasting. New York, I loved your hikes, your food, and oh how I loved your beer. Thanks Ausable Brewing Company for giving me a fantastic hefeweizen and a unique Brett I loved.